Important Note: though this brew is subjected to very cold temperatures while maturing, it should be enjoyed at cellar temperature (and in a glass, of course!) to experience its complete flavor profile. Well, this is it – the original Bavarian Eisbock, and it’s as appreciated now as it was when it first became popular so many years ago. How appreciated is it, you ask? There’s actually a beer festival devoted to eisbock that’s celebrated in Kulmbach every March. The occasion begins with a ceremonial chopping open of an icy wooden barrel from which flows the malty guest of honor. Kulmbacher Eisbock is brewed with five different malt varieties, lending tremendous complexity. On the nose, look for sweet aromas of caramel malt, figs, fresh biscuits, rum, and a touch of apricot. There’s also a creamy note of oak with an underlying note of vanilla. On the palate, expect a full body with some mildly roasty notes, along with touches of raisins, maple syrup, and cookie dough. Notes of chocolate, plum, and caramel flow through the background, and it finishes with hints of roasty coffee and walnut. This brew makes a great nightcap companion to a good book, or some chocolate covered figs (or both!). Due to the high alcohol content, this is a beer that you can consider aging for a year or two to watch how it matures. In the town of Kulmbach, in an area known as Franconia in northern Bavaria, archaeologists have found proof of the region’s deep-rooted brewing history. The remains of beer bread were discovered in a vessel approximately 3,000 years old, and other evidence has established that the art of brewing was alive and well in Kulmbach since at least the middle of the 1300s. Because of the town’s impressive history, Kulmbach is often said to be the origin of Germany’s brewing industry, a sort of spring from which the brewing culture of Bavaria has flowed. Thus, it comes as no surprise that the Kulmbacher Brauerei, which was founded in 1846, produces some of Germany’s finest beers. In Franconia, beer is not simply a beverage, it’s a way of life. In fact, the town square of Kulmbach has been home to a beer festival known as Bierwoche (“beer week”) on the final weekend in July for well over 125 years. Kulmbach is particularly famous as the source for some of Germany’s more potent offerings. Originally, these beers were designed with a higher alcohol level to allow the beer to withstand traveling long distances during export across Europe. However, it was a fateful mistake that led to the creation of one of the region’s strongest beers; the new style was not designed but rather stumbled upon via accident. As legend has it, a barrel of bock beer (a strong, malty, locally-made brew of about 6.5-7.5% ABV) was mistakenly left in the yard outside the brewery, where it sat forgotten and covered in snow through the winter. When the brewers eventually found it, the wooden barrel had burst open and the contents were partially frozen. Being curious and perhaps a bit brave, they chipped away the ice to get at the beer beneath, determined to see what had happened to their bock. The brewers were amazed to discover that the remaining beer was still smooth but much more concentrated and rich than the original bock, with a higher alcohol content. Because water will freeze before alcohol, much of the bock’s water content turned to ice, leaving a beer with a concentrated level of alcohol and sugars in relation to the remaining volume. This episode inspired the brewers to refine and perfect the technique, leading to the introduction of what would become an iconic beer style for the region: eisbock. However, eisbock is not the only beer Kulmbacher Brauerei produces; the brewery currently brews more than 20 other beers including the flavorful and crisp pilsner we’re also featuring this month to showcase the very broad spectrum of beers that flow from this brewery. While the two brews are about as different as night and day, it’s interesting to note that they are both lagers (as is most beer produced in Germany, although several German beer styles do use top-fermenting ale yeast, such as altbier, kölsch, and hefeweizen). 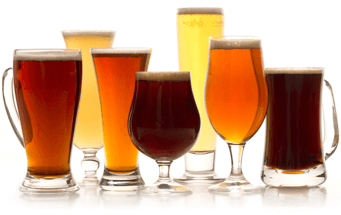 Beer is a beverage with a truly amazing diversity of flavors and aromas. We hope you enjoy this month’s study in contrast. Prost! If you can read German and would like more information about the Kulmbacher Brauerei check out www.kulmbacher.de.